Wheelchair ramps are available in a variety of designs and materials. They are ideal for negotiating steps and curbs, when putting a wheelchair into a car, and in places where it is necessary to compensate for height differences. To make the threshold in a home or commercial building accessible without structural modifications, semi-permanent or portable ramps can be fitted to provide the appropriate slope for a more comfortable – and safer – transition through a doorway. When determining the type of ramp you’ll need, the most important consideration is the steepness or length of the ramp per unit of height. For a permanent wheelchair or scooter ramp that offers public access, it is typically recommended to design your ramp with the lowest possible slope. Determine the incline that your wheelchair or scooter is capable of negotiating. This information should be available in the owner’s manual of your mobility device (wheelchair, scooter, etc). Measure the horizontal distance from the highest point. Measure the width of the entrance. Measure the vertical rise of the entry way. Use the measurements & specifications to determine the proper ramp length and width. See chart below. *** The Americans with Disabilities Act standards suggests 1 foot of ramp for every 1 inch of vertical rise. Be sure to visit this site for information on building your own home wheelchair ramp. Track Ramps are designed to line up with the wheels of the wheelchair. 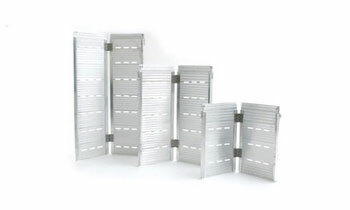 Some use a telescoping design that extend to be used on steps, vans or curbs. Most are made from anodized aluminum. Designed for electric and manual wheelchairs. 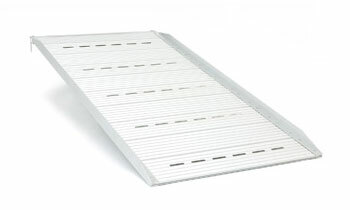 Threshold Ramps are designed indoor and outdoor use. They allow a wheelchair to move over difficult obstacles such as doorways and other raised areas. They can be installed permanently or be moved from one area to another. Most are made from aluminum. Pathway Ramps are typically designed for outdoor use. They typically provide a path to enter the main entrance or doorway of a dwelling. They can be installed permanently (with or without railings) or be moved from one area to another. Most are around 3 ft in width and from 3ft – 10ft in length. Made from aluminum with a weight capacity of up to 900 lbs. Modular Ramps – Ramp, curb, and deck systems with a modular design allow customized permanent or semi-permanent placement. The units may include platforms, integral landings, self-contained leveling systems, supports, wheels, flanges, and handrails. The modules may be connected by bolts or clamps, or fitted together. Many manufacturers of modular ramps offer custom dimensions and will ship all of the parts with installation instructions. – Abledata.com. 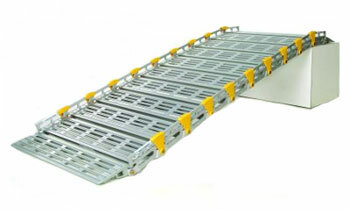 Single-Fold Ramps are easy to handle and set up. The Single-fold ramp is designed to fold in the middle so you can carry it if necessary. 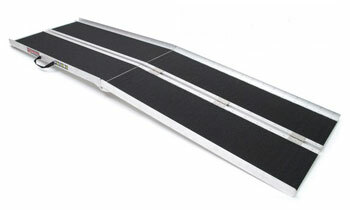 Multi-Fold Ramps for Wheelchairs – Similar to the single-fold, the multi-fold ramp can be folded not once but twice and be carried like a suitcase. Its added length allow taller obstacle to be maneuvered. 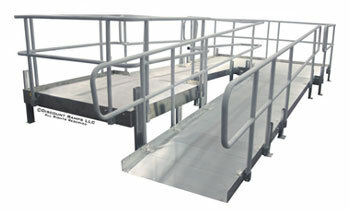 Roll Up Ramps – Designed for maximum transportability. 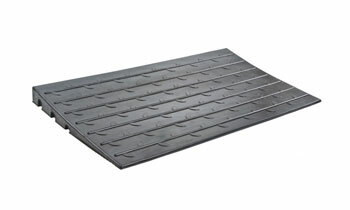 This type of ramp has a hinge design that allows it to be folded up for convenient storage. Most are made of aluminum. Telescoping Ramps – Most wheelchair ramps are designed with a telescoping frame that can extend or contract to accommodate most scooter and wheelchair users. The design is simple. It has two fitted platform sections that slide against each other. Most are made with some type of aluminum and have a durable non-skid driving surface. Van Wheelchair Ramps – Designed for quick access to a van side or back door. Accommodates scooters and wheelchairs. Easy to install. Lightweight and manually operated. Most made from high-strength aluminum and feature a non-skid driving surface. Have a high load capacity up to 800 lbs. Portable wheelchair ramps are typically manufactured using aluminum (rubber is often added for increased traction) but occasionally other material like steel and fiberglass are used. With portable ramps, the lighter material, the better since they are handled and manipulated often. Permanent ramps, on the other hand, can utilize a wider variety of materials. Steel, wood, aluminum, even concrete can be used for constructing a wheelchair ramp. American Access – Founded in September, 1997 by Brian Clark According to two leading industry sources, American Access is one of the largest wheelchair ramp providers in the country. 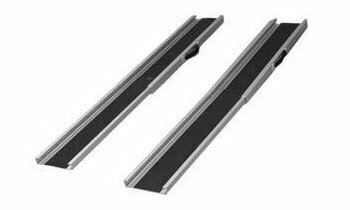 In addition to ramps for homes, the company also supplies commercial ramps for schools, colleges, churches, and business locations. American Access distributes from warehouses around the country holding more than a million dollars in portable ramps and living aids in stock. See The American Access Home Page Here.